Digital multimeters are the most important devices needed to carry out most electrical troubleshooting tasks. They are used for installation, repairing, troubleshooting, and testing of electrical appliances. Due to the wide availability of this device in the market, choosing the best model can be confusing. When buying a multimeter, what are the things you need to consider? This buying guide is intended to help you select the ideal multimeter for your electrical troubleshooting needs. Resolution simply means a change in the output signal that is caused by a proportionate change in the input signal. The multimeter resolution is determined by the number of digits the multimeter can display. When buying a multimeter, make sure you select the most suitable one with the right display range of about ±1,999 or ±19,999. One very important feature of the best multimeters is extreme accuracy. Generally, the accuracy of a multimeter is expressed as a percentage of reading. When selecting a multimeter, try to choose a product with about ±0.1 accuracy since they offer more precise readings than most other models. This feature is the most important feature in a multimeter because the effectiveness of a multimeter is always measured by its level of accuracy. There are basically two types of multimeters: Average Responding and True RMS. The latter is usually more complex and more expensive than the former. If you want to buy the best quality multimeter, it is always better to select the True RMS multimeter because it provides all the features you will need to carry out your work. The input impedance of a multimeter is usually very high. However, there are difference levels of input impedance obtainable with the different types of multimeters. When selecting a multimeter, select one with high impedance to make sure you measure with the highest rate of accuracy. When choosing a multimeter, you don’t have to depend only on the design or features of the product. Select a multimeter from a trusted manufacturer with a proven track record of quality and efficiency. 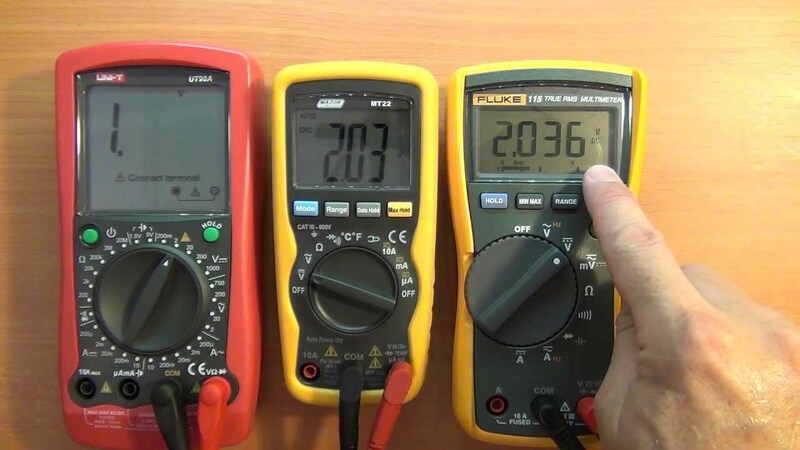 There are different types of multimeters out there and it may sometimes be difficult to know their difference if you don’t have a solid knowledge of the functionalities and features of a multimeter. One way of making your search easier is by selecting a multimeter from a trusted manufacturer with lots of good reviews and high customer ratings. Even if you are a professional and can differentiate between a good and bad multimeter, it is still recommended to select a good manufacturer because they may have a better product warranty than that offered by less popular manufacturers. Finally, product reviews from customers and websites like this can help you a great deal when buying a multimeter. Look at the Amazon product page of the website and see what customers are complaining about or recommending about the multimeter. There are different types of multimeters meant for different types of troubleshooting tasks. If you go through customer reviews you will be able to find out whether the multimeter is right for your needs. A multimeter will always be a vital tool for any electrical problem solving. If you follow the above tips and guide, you will be able to confidently select the ideal multimeter for your effective electrical diagnostics.